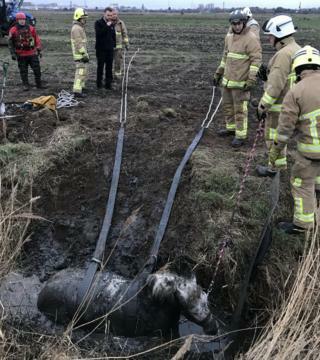 A little Welsh pony had a “very lucky” escape after becoming trapped in a muddy ditch up to her neck – with only her ears not covered in mud. The RSPCA said it was “total chance” the animal was found and she was “very lucky to have been spotted”. Firefighters managed to free the pony, now named Puddles, from the ditch off Marshfoot Road, Grays, Essex on Saturday. A spokeswoman for the RSPCA said officers were trying to find the owner. 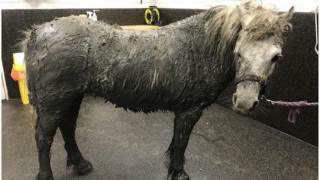 RSPCA inspector Caroline Richardson said the pony had apparently been straying in the area for three months and she was extremely fortunate to be alive. “It’s amazing that she was spotted as she was absolutely covered head to toe in mud and was neck-high in muddy water,” she said. “You could just see her ears – which were the only part of her that were still grey,” she added. The charity believes Puddles had been stuck there for days as she was freezing cold, shivering and clearly exhausted. “She was a little stiff and terrified, incredibly she came out unharmed. She’s a very lucky little pony,” said Ms Richardson, adding that if they were unable to find her owner, then they would “find her a loving new home”. The grey pony is about 11 hands high and is not micro-chipped.